h.Art, Herefordshire’s Open Studios event is fast approaching, kicking off with our Exhibition Private View on the evening of Friday 9th September. New to the Wobage Artisan Market for 2016 , WAM is delighted to be offering our visitors the opportunity to participate in a selection of taster workshops provided by several of it’s professional makers. These workshops will take place throughout the duration of the Artisan Market, on Saturday 17th and Sunday 18th September. Discover your inner maker at our Taster Workshops under expert tuition: Basketry for children and adults with Clyde Hoare, Pottery for children and adults with Jeremy Steward, Lino-cut, Mono-Print and Direct Relief with Anneliese Appleby, Felt-Making with Pearl Taylor, Bookbinding with Sarah Jarrett-Kerr and Card Braiding with Mary Jolly. 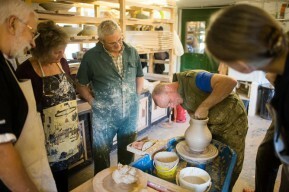 Resident Wobage potter Patia Davis will demonstrate wheel-throwing and slab-building of her stunning earthenware domestic-ware and the WAM talk for 2016: ‘Wobage, Mick Casson and his legacy’ Ben Casson will share with us the compelling 40 year history of Wobage; through it’s transformation from dairy farm to a thriving creative hub for pottery, basketry, jewellery and furniture making.